HSLEOA Officer of the Year Ryan Domingo and his mother, Stella Domingo, display his awards at a ceremony in Waikiki. 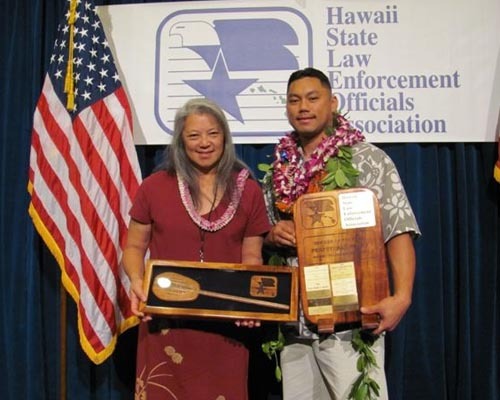 Officer Ryan Domingo has been named Hawaiʻi Police Department’s “Officer of the Year” by the Hawai’i State Law Enforcement Officials Association (HSLEOA). Domingo was honored for administering life-saving first aid to a victim of gunshot wounds. On May 13, police responded to a disturbance involving gunshots in Hilo. At the scene, officers quickly identified and arrested a suspect, and Domingo found a 55-year-old woman lying on the kitchen floor in a pool of blood. He immediately applied pressure to her wounds to control the bleeding. The victim believed she was going to die. For more than 20 minutes, Domingo reassured her and kept her focuses and calm. His comfort and compassion were critical in saving her life. Domingo also obtained important evidence by recording his conversation with the woman. The suspect was charged with attempted first-degree murder, burglary and two counts of attempted second-degree murder. The victim suffered multiple gunshot wounds to her left shoulder, right hand, left knee and right thigh. She is expected to make a full recovery after months of rehabilitation. The award was presented at a banquet at the Sheraton Waikiki Resort on September 21.